Kenneth Browne is a final year communications student from Wexford. He has been involved within the SU executive for the past two years as Humanities Convener and Clubs Officer. He is a former class rep and is the current station manager of DCUtv. Browne wants to see a bigger emphasis on mental health for students on campus with. He believes family, friends and being active are key to mental health. Browne also wants to extend the library opening hours at exam time and hold an outdoor music ball if there’s enough interest. Why do you think you’re an ideal candidate for President of DCU SU? I’ve had two years experience on the SU executive as Humanities Convener and this year as Clubs Officer. I’ve been in the SU on a weekly basis as part of the integral workings of it. If someone was on the outside of a society and they wanted to take over as chairperson for the next year, it’s very difficult if they don’t know how everything runs. Before I lived on campus I spent most of my day on campus being in the middle of it. I want every student to have the opportunity to engage and to become as passionate and proud to be a DCU student as I am. What differentiates you from the other two candidates? Apart from the experience, I suppose creativity. Everything I do, I try to do it just a little bit differently. For example, I have a cardboard cut-out of myself going around. It’s something very silly but it gets a bit of coverage and people are getting a laugh out of it. It’s the same for my campaign video. I tried to put a bit of humour in it but more importantly, it’s got a lot of core stuff with my ideas as well. As I said before, the fact that I’ve been in the middle of everything since day one, I’m not sure if the others would have been to the same extent as a core part of society and club life in DCU. What would you do to make students more engaged if you’re elected to office? There are four faculties and four weeks in a month. I’d like to pick a faculty a week and dedicate one or two hours where I just stand in that faculty and give people the opportunity to talk to me. I really want to push non-alcoholic events. There should be more facilities there for people who want to interact with the SU that doesn’t involved going to the bar for a pint. One of the really simple things is in The Venue, they’ve two really big screens. I’d like to see regular movie nights there. All it takes is for someone to plug in a laptop and turn on the speakers. You get good numbers to them and they’ll be free of charge. I’d like to look at smaller things you can do that might reach different things at a time rather than trying to host one big event to push everyone to it. What would you do to promote student turnout at referenda? We’ve kind of got a traditionally low turnout when it comes to referenda in DCU. It goes by the topic as well. I know it’s combined with the elections, but I would hope to see a very high turnout for the upcoming referendum on the new student centre because that will affect everyone. I know the USI referendum affects everyone but it’s not a topic that’s as physically engaging for students. You can gage a building if it’s there in front of you and you can reap the benefits where as the USI would be something that would filter down throughout the months. Promotion and how things are promoted is key as well. I’m station manager with DCUTV this year and the big thing I’m passionate about is videos. You can reach hundreds and thousands of people with a video as opposed to handing out sheets of paper or sending emails. Why should students vote for you this week? From day one I’ve been here and I’ve tried to be a part of everything that goes on. I want every student to have the opportunities to engage and be as passionate and as proud to be a DCU student as I am because I think we’re an incredibly proud people. I absolutely love it here and I want to give that back. 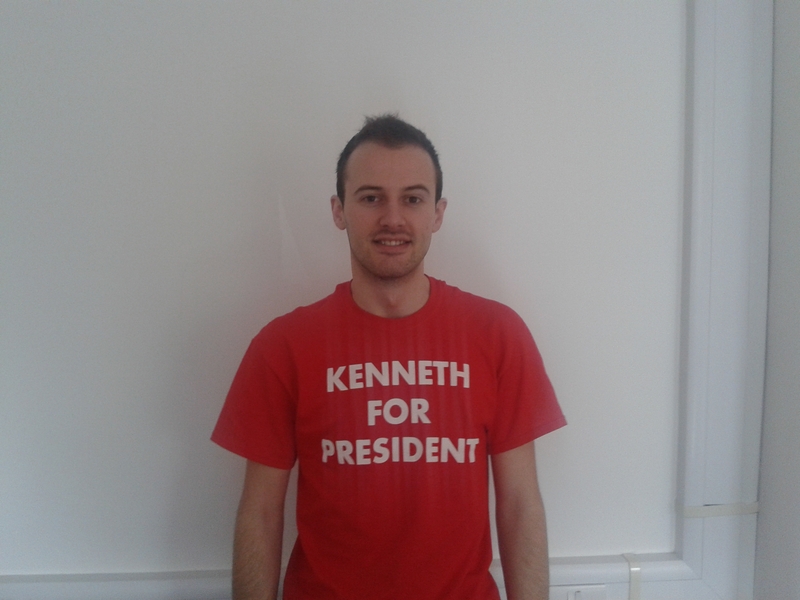 See how Kenneth fared in our opinion poll here.